Hello all! My name is Tuck. 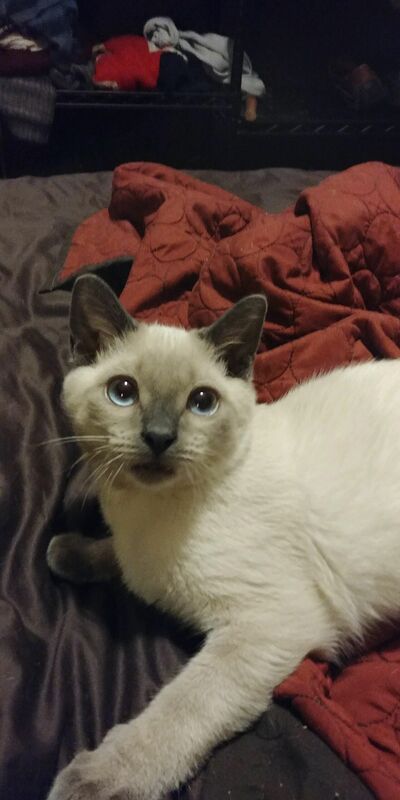 I’m a spunky little five month old lilac point siamese. Don’t let my beautiful blue eyes fool you, I’ve got purrrsonalitiy for days, just toss a crumpled piece of paper and I’ll come running. Myy favorite toy of all time has to be my very own tail! I can lay on my back in my foster moms lap and go after that thing for hours. I also love to play with my best dog buddy Lola and when we get tired she makes a great pillow to take a nap. I’m not as chatty as most siamese but I do love to say good morning to my foster mom until she picks me up so I can hang out on her shoulder while she makes her morning coffee. It makes me so happy I can’t stop purring! Sometimes. I am so busy relaxing that I forget to keep my tongue in my face but no one seems to notice. Being curious by nature, I’m very excited to explore my new forever home. I am an FIV positive kitty but all that means is that I will have to live indoors all the time an should got see my vet 2 times a year instead of one but other then that I’m perfect! I should live in a home either as an only cat or with other FIV positive kitties. I look forward to meeting you! Please contact Pixie Project at info@pixieproject.org or call 503-542-3433 if you are interested in meeting him!